Joan Lois Sipes, age 85, formerly of Westminster and Bonneauville, PA, passed away peacefully on Saturday, January 12, 2019. Westminster. 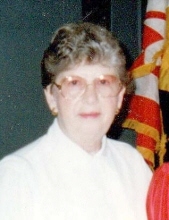 She enjoyed motorcycling with her husband and was a charter member and past secretary of the Maryland Goldwings and a member of the Maryland Retreads. She also enjoyed bowling and reading and was a proud supporter of the Girl Scouts of America and Boy Scouts of America. John, Devin, Kassie and Christy; and several niece and nephews. In addition to her husband and parents, she was preceded in death by a grandson, Derik Sipes and sister, Lavonne Wilson. A graveside service will be held on Friday May 17, 2019 at 11 am in St. Paul’s Lutheran Cemetery, at the corner of Clear Ridge Rd and Middleburg Rd, Uniontown MD. Foundation, 3152 Little Road, Suite 146, Trinity, FL 34655 or www.alzheimersresearchfoundation.com/make-a-donation. To send flowers or a remembrance gift to the family of Joan L. Sipes, please visit our Tribute Store. Guaranteed delivery before Joan's graveside begins. "Email Address" would like to share the life celebration of Joan L. Sipes. Click on the "link" to go to share a favorite memory or leave a condolence message for the family.